My brother and I discovered my dad's copy of the D&D basic set blue box and set our pre-teen minds alight. Nothing like being a poor family in the middle of hicks-ville and then finding the escape you've been aching for. In first grade I got tracked into the once a week gifted program in my school district. Early on, one of the guys spotted the Basic D&D rules on the shelf. D&D on the shelf: that's a cool school you had there. The elementary school gifted program in my school district is one of the few reasons I retained a shred of sanity after exiting the public school system. 1980. I was 10 years old and my dad showed me an article about D&D in my mom's People magazine. I was hooked. Played with a friend and his older brother, then soon after set up our own group. Still play with a couple of those guys. Oh how my dad came to regret showing me that article. That article is a fabulous time capsule from the period. Thanks for sharing it. It's also better-written than most material done on D&D from the period, and shows a better understanding of the game. It is surprisingly non-terrible. It's a good article, but it did leave my young mind with misapprehensions about what actually happened when you played D&D. The article included a photo of Gygax positioning lead figures on a piece of rocky terrain, so I figured it was some kind of minis game where you built (physically) your own dungeon. Which sounded awesome. I was baffled with what I found in the box once I bought the Holmes boxed set a couple weeks later. Mazes and Monsters, the Tom Hanks movie. Seriously. I played Avalon Hill wargames in high school and vaguely had heard about rpg’s, but had never seen one. Then I saw Mazes and Monsters on tv, and we tried to reverse engineer what we tought was an rpg from the movie. We never got far, but we were intrigued. Then I decided I wanted to pick up miniature wargaming and bought a newly released game, a boxed set with a warrior cleaving the skull of a skeleton, and which was called Warhammer (1st edition). It had 3 black rulebooks, and the third was about fantasy roleplaying. And suddenly there was light! 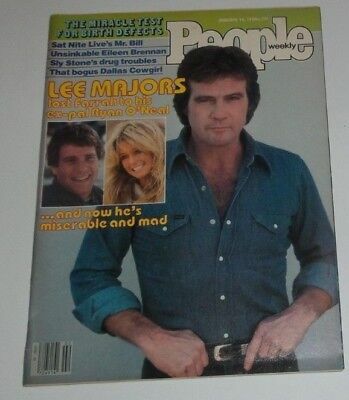 This was 83 or 84. Sunday, January 27, 1980, my birthday. Dad handed me a copy of Parade Magazine (it was included with our newspaper) and said there was an article in there that I might like. 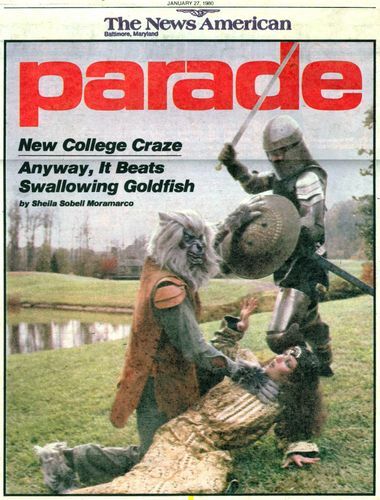 It was "Ogres and Monsters Take Over the Campus" by Sheila Sobell Moramarco, and it presented a strange conglomeration of Society for Creative Anachronism, Dungeons & Dragons, and what we would today call Cosplay. It's interesting that such a banal article should change my life so profoundly. By the end of the day I was playing "Mazes & Monsters" with my reluctantly-enrolled brother. We were just making the rules up as we went along, using a big maze taken from Dynamite Magazine, tokens taken from Sorry, and a bunch of scavenged d6. It was mostly like a boardgame, but we were trying to play it like Moramarco described. A couple days later dad paid for Holmes Basic, which I bought at Hammond Hobby in Cottonwood Mall. We started playing immediately and sort of stumbled around learning the rules over the next month or so. As soon as the paper route generated enough income, I bought the AD&D hardbacks. My "original" was (I think) a 5th print DMG. Used it at the table forever. Binding still excellent. I've mentioned it before, elsewhere, but the game shop guy was always trying to sell me the "white box" original D&D game, of which he had something like 8 or 10 in the shrink. Because I was such a wise 15 year old, I scoffed at his weak attempts to bamboozle me into buying "old stuff", even when the price dropped to five bucks a set. Because I was such a wise 15 year old, I scoffed at his weak attempts to bamboozle me into buying "old stuff", even when the price dropped to five bucks a set. Wow, you sure showed him! As for me, kids at school (this would've been late 70s) started playing some dungeon game at recess. It wasn't D&D, more like barely freeform: The "DM" would draw a dungeon, and you'd say what you wanted to do. Then the DM would narrate the results, which would usually be juvenile and absurd. There weren't even dice; it was all fiat. I suspect that it was D&D passed through several layers of rumor and word of mouth. The first proper RPG I played was FASERIP. I didn't play D&D until years later, because (a) it was satanic, and (b) I was a sophisticated gamer who didn't need introductory games. That was corrected not long after and we were soon fighting these things called kobolds. My first trip to the FLGS to buy a RPG: Gondor, Sauron, and Citadel of Blood. I'm not sure if I was clueless, distracted, or both! I got my start with video games too. My uncle gifted us a bunch of Intellivision games which included: Advanced Dungeons & Dragons: Cloudy Mountain. I loved this game. Only vaguely D&D-related, but fun, and rather nerve-wracking as you wandered through the (green) darkness. Got to BGG, then by accident to RPG (tavern), got appointed rpg gotw, started thinking about rpg's and playing. Looked for The Way of Kolinahr, sent an email to a Dutch geek. He and some friends came over for a Star Trek session. On the Geek got drawn into a Fiasco pbf. That is my start. I started high school, some of the elder children were playing. I joined in. Hooked forever more. Sunday, January 27, 1980, my birthday. Dad handed me a copy of Parade Magazine (it was included with our newspaper) and said there was an article in there that I might like. A friend invited me to play a game called Gamma World, it wasn't like anything I had played before, you described what you were doing , rolled dice to see if you achieved it. A few months later one summer holiday a few of us were playing D&D, never looked back. "We're going to play this game all fall break long. It's totally up your alley, you'll like it! Show up at my house at 10:00 on Saturday!" And I did. And it was totally up my alley.